The Bungalow is a story of friendship, family, love, pain, loss, change, but most of all, enduring love. When Anne decides on a whim to follow her best friend Kitty to Bora-Bora to be a nurse during World War II, she knows what - and who - she’s leaving behind, but she has no idea what lies ahead: new friendships, new love, but also secrets, lies, and tragedy that will end up haunting her for decades to come. Jio has this way of drawing you into the story and making you wonder what’s going to happen next. 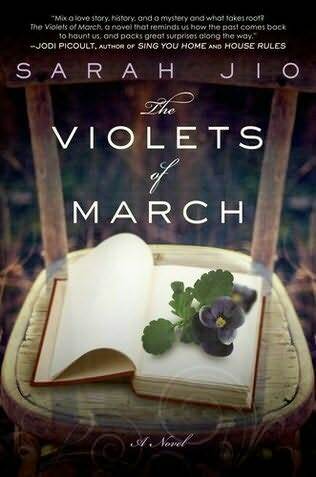 The Violets of March was a real page-turner, and The Bungalow is no different. There are all these little threads of mystery and intrigue that weave together to form a plot that holds your interest and keeps you guessing. Friendships are one of my favourite types of relationships in books, and while I love reading about really close friendships, I appreciated that Anne and Kitty’s friendship wasn’t all sunshine and roses. It felt realistic, and it fit the overall mood of the book. I also enjoyed the romance in the story - forbidden love in a time of turmoil and uncertainty. It was sweet and lovely. Overall, I enjoyed The Bungalow and would recommend it to fans of women’s fiction or anyone who enjoys stories with lush settings, a wartime feel, and an intriguing mystery. Have you read The Bungalow? What did you think? Do you enjoy historic fiction? How about foreign settings? I like woman's lit but I don't read it much. I should, though.